Wasps stunned league leaders Exeter Chiefs to move into fifth place in the Premiership following an outstanding 26-19 triumph at Sandy Park on Sunday. Exeter actually began superbly, with Jack Nowell and Nic White touching down, and they looked on course for a big win, but they were pegged back by the Midlanders as Willie le Roux, Juan de Jongh and Marcus Watson went over. Last season’s semi-finalists then proceeded to control the second period and deservedly crossed the whitewash for the fourth time through Zurabi Zhvania, which earned them a deserved win. The Chiefs had a late surge, though, and Jack Yeandle scored, but they had to settle for a losing bonus-point. Dai Young’s men have struggled in defence this season but, after the Chiefs’ early onslaught, they held out manfully for the rest of the game. Exeter were on the front foot in the initial exchanges and the visitors duly succumbed when Henry Slade’s grubber through was gathered by Nowell and the wing did the rest. White then followed him, going over from close range, and they continued to go through the phases as Wasps failed to get hold of the ball. Rob Baxter’s men started to overplay their hand, however, and the away side’s defence got on top. It was no surprise to see them knock on, giving Dai Young’s charges the opportunity to counter-attack. Play was shifted wide and good work from Elliot Daly and Watson allowed Le Roux to finish. That score gave Wasps the momentum and Nathan Hughes, who produced his best performance of the season, powered towards the line minutes later. The number eight was taken down just short but Simpson was on hand to score and take them ahead. 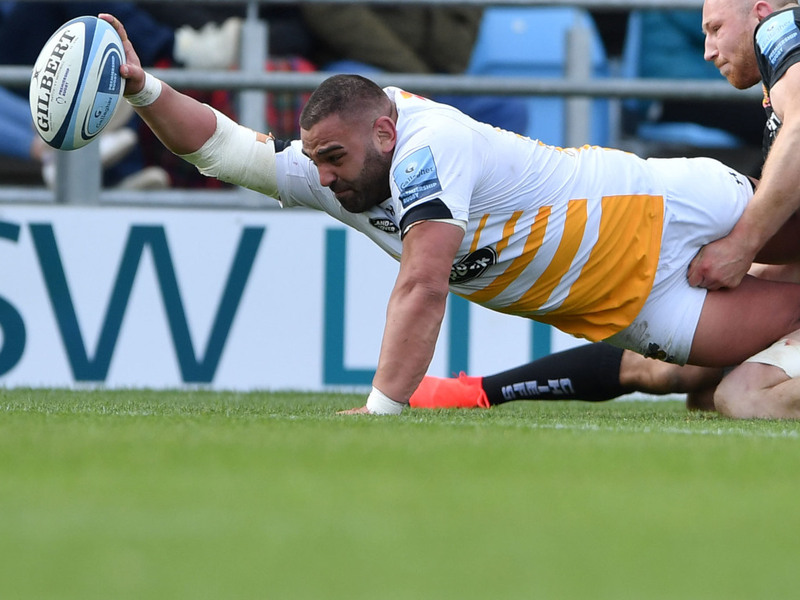 Exeter were now struggling with Wasps’ line speed and the Coventry-based outfit went over for the third time as Hughes’ kick was not dealt with by the covering players and Watson collected to touch down for a nine-point buffer at the break. It was an outstanding response from Young’s men having been outplayed in the opening 20 minutes and they went on to control the third quarter. The Chiefs struggled to gain any territory and the visitors dictated play magnificently, with their big ball carriers giving Simpson plenty of front foot ball. As a result, holes were appearing and Zhvania surged through a gap. The prop then linked brilliantly with Gaby Lovobalavu, taking the centre’s off-load to touch down. It secured the victory, despite having to battle late on when Yeandle crossed the line to set up a nervous finale.